Author Tinky Weisblat prepares rhubarb brownies from the cookbook, "Love, Laughter, and Rhubarb." A small, young, and not-yet-ready-to-pick patch of rhubarb grows in the yard at Hawley, Massachusetts, cookbook author Tinky Weisblat's home. A plate of rhubarb brownies made by cookbook author Tinky Weisblat. I visited Weisblat at her home in Hawley, Massachusetts. As she prepared a recipe from "Love, Laughter, and Rhubarb," I asked where the title came from. Tinky Weisblat: I was trying to think of things that sum up my life in my cooking. I have to say, rhubarb is not the only food that I adore and cook with. But I thought that this was kind of my mantra for life: “If you don't cook with love, it doesn't work.” I mean, literally, it does not work. I've had days when I wasn't feeling very loving, and nothing comes out right. And laughter is just how we get through our life, right? 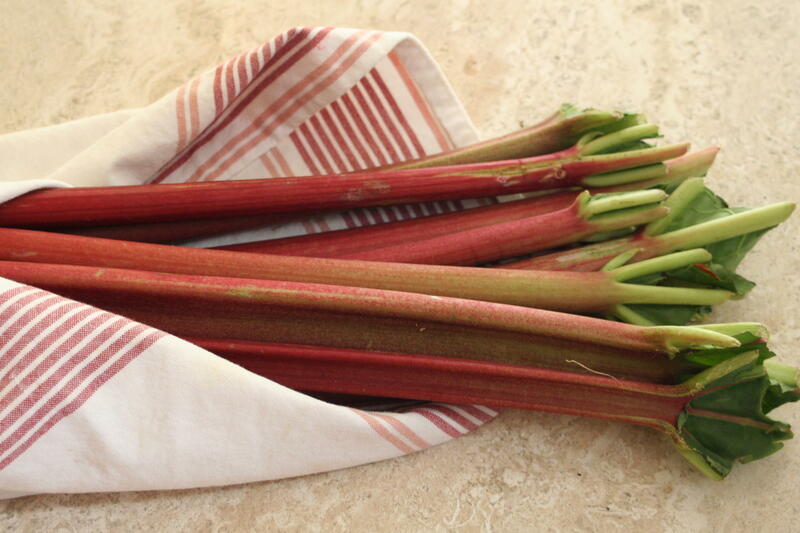 Rhubarb is such a wonderful spring thing here in New England, and it represents to me: hope, and people I've loved, and strength, and color, and all the things that it embodies --as well as a wonderful flavor, and a wonderful, flexible thing to cook with. Carrie Healy, NEPR: And it's a little dangerous. It's a little dangerous -- like so much of life. Yes, because if we eat the leaves, we get sick. Not that I've ever actually tried, but we have to keep that in mind. It needs a little bit of help in order to become more palatable? There are people who pick the rhubarb and go, chomp, chomp. I was really quite astonished, because it's not something that I would ever do. How are you preparing Satan’s celery today? As we speak, my rhubarb is not quite all the way up, so we’re doing something that uses some jam that I made with rhubarb from the past. So, we’re going to make my rhubarb with cocoa brownies. These aren’t all sweet recipes. There are savories and main dishes. I think that’s important. For one thing, there a lot of people who don't eat much sugar. And it's just fun. You know, the rhubarb pizza is the one that was the most of a challenge, because I really wanted to do a rhubarb pizza. I tried all these different rhubarb pizzas, and my family was very depressed, and said, “That's not the one.” We finally got to the one that was the one, and it was very satisfying. Your rhubarb patch: do you tend it? Or do you just feel very grateful that it's there, and it fends for itself, largely? Somewhere in between. I have lost rhubarb. I can kill literally anything. I'm not a gardener, or farmer. So my current rhubarb is actually new from last year. Somebody gave me some plants, taking pity on me. How much rhubarb did you go through to create this cookbook? A lot. The good thing is, you only do a little bit at a time. You can hit up someone else’s patch every time. I think that not everyone has my passion for rhubarb. The selectmen designated May 26 "Hawley Rhubarb Day" at my instigation. I think rhubarb resembles our town: It’s colorful. It’s old-fashioned, but it’s also adaptable to new flavors and influences. It’s very strong. It’s very resilient. Some of the things that these little towns go through are just staggering, but they go on! They endure. And they get through every winter, and come up again in the spring. And that’s kind of why I think it's important for it to be right here, right now. Weisblat's brownie recipe from her cookbook is reprinted below, with permission. Preheat the oven to 350 degrees. Grease the bottom of an 8-inch-square pan. In a 2-quart saucepan over low heat melt the butter. Add the sugar, and stir to combine. Return the mixture to the heat briefly—until hot but not bubbling. (It will become shiny looking as you stir it.) Remove it from the heat, and let it cool briefly while you assemble the other ingredients. Stir in the cocoa, the salt, the baking powder, and the vanilla. Add the eggs, beating until smooth; then stir in the flour and the chocolate chips. Spoon the batter into your pan. Drop little bits of jam around the pan so that each brownie square will get a little jam; then swirl them just a bit. Bake the brownies until they solidify and just start to brown on the edges (30 to 35 minutes). Remove them from the oven. Cool the brownies completely before cutting and serving them. Makes about 16 brownies, depending on how large you cut them. The western Massachusetts town of Hawley marks Rhubarb Day on Saturday, May 26, 2018 from 2 p.m. to 5 p.m.